I read your article in the Sonoma County Gazette which was republished at Paul Connett’s Fluoride Alert website – Fluoridation convert. A scientist explains what changed her mind. You briefly described scientific studies which you claim convinced you to take a stance against community water fluoridation. Apparently you found these so convincing you are now a board member and steering committee member of several anti-fluoridation organisations. My purpose here is to discuss the studies you refer to because I think your interpretation of them is mistaken. I offer my critique of your interpretation in the spirit of normal scientific exchange and discussion and hope you will respond in the same way. Good on you. I believe experience in scientific research, scientific publication and the use of scientific literature helps cultivate a critical and intelligent approach to the literature. I think this is essential if one seriously wishes to make sense of apparently contradictory evidence and overcome one’s own confirmation bias. • Tooth decay has plummeted in developed countries worldwide, regardless of fluoridation. Just a minute! Did you look at the WHO data carefully? Did you take into account the well established multiple factors, beside fluoride, influencing dental health? (Things like diet, health services, dental treatments available, other social health services etc.) Did you consider the difficulty of drawing conclusions from data, especially a small amount of data, taken from different cultural, social and political situations? And, importantly, did you check out the WHO data which compared data from fluoridated and non-fluoridated areas in the same country? (Many of the other confounding factors can be eliminated by making comparisons within a country). The figure on the left below is the one most often used by anti-fluoride activists for obvious reasons – it confirms their bias. But it suffers from all the problems mentioned above (including the fact that the straight lines result from using just 2 data points for each country) and so does not allow a truly objective person to conclude what you have. Surely with your scientific experience you checked out the detail in the data – such as the WHO data for the Irish Republic which included that for both fluoridated and unflouridated areas? The plot of that data (see figure in the right) suggests your conclusion is unwarranted (the dotted line is the average of fluoridated and unfluoridated and corresponds to the data in the graph on the left.). My conclusion from the WHO data is that tooth decay has decreased in all these European countries over the last 30 years. Fluoride is just one factor in this but it is wrong to conclude from the WHO data that fluoride is ineffective (see Fluoride Debate). • The one clear correlation with water fluoridation is disfiguring “dental fluorosis” supposedly only a cosmetic problem. But, Jane, have you looked at the available data on dental fluorosis carefully? Your conclusion is a misinterpretation which anti-fluoride propagandist love to promote because it confirms their bias – “fluoridation causes a “disfiguring” complaint – dental fluorosis.” But “disfiguring” or serious dental fluorosis is not caused by community water fluoridation. It is caused by excessively high fluoride dietary intake due to high natural levels of fluoride, industrial contamination or obsessive consumption of toothpaste. It is also very rare in the US, Europe, Australia and New Zealand. 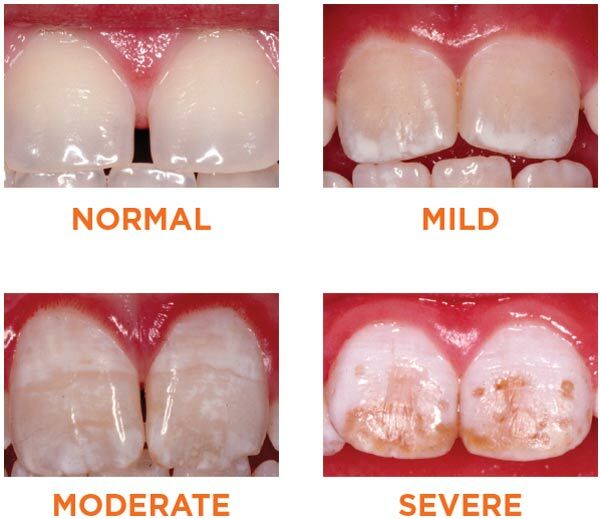 Some idea of the appearance of dental fluorosis at these various levels in given by the photos below. 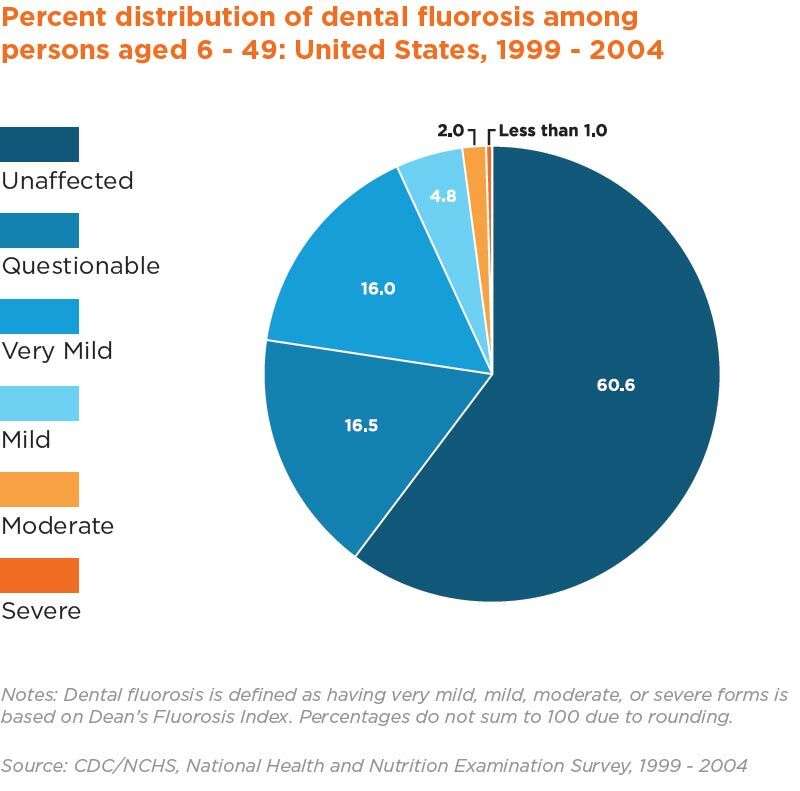 I agree that often (not always) the occurrence of total dental fluorosis may be higher for people in fluoridated areas than in non-fluoridated area – but the “disfiguring” moderate and severe forms are not the result of community water fluoridation. The milder forms which may arise from community water fluoridation tend to be either unnoticeable or so mild as to be of only cosmetic significance. So Jane, I am surprised that with your scientific experience you came to such an unwarranted conclusion. If you had truly looked at the data intelligently and critically surely you would not have drawn the extreme conclusion you did about community water fluoridation and dental fluorosis. What about studies showing fluoridation is ineffective? You refer to studies which show only minimal or no difference in oral health between fluoridated and non-fluoridated areas. I have also seen those studies. But you and I are scientists so know we should always look at the details and not rely on the conclusions drawn by political activists who misinterpret these studies. Hell, as scientists we shouldn’t even rely in the conclusions made by the researchers themselves – we should always look at the details. Tooth decay for children living in fluoridated and unfluoridated areas has been compared in many studies. It is easy to find results confirming ones bias – pro-fluoridation or anti- fluoridation. So as scientists both you and I should consider all the studies – not just those confirming our particular bias. That should be obvious to us. I have seen plenty of studies showing a positive effect of community water fluoridation on oral health – so how do I deal with those other studies showing no effect? Well, I certainly don’t ignore them but it helps to look at the details. For example, in my article Fluoridation: what about reports it is ineffective? I discussed a 1985 paper by a New Zealand researcher, John Colquhoun, who found no differences in tooth decay between children in fluoridated and unfluoridated areas. Colquhoun, who was also an antiifluoridation campaigner, chose to conclude that fluoridation had no effect on oral health. But here is the problem – the children in the non-fluoridated areas he studied all received regular topical dental fluoride application treatments, whereas most of the children in the fluoridated areas did not. So the lack of effect was hardly surprising. In scientific terminology his control group was not a proper control. This study showed tooth decay increased after fluoridation was stopped in one town (Stranraer) even though there was a general decrease in tooth decay (no doubt resulting from things like improvements in diet, tooth brushing, dental treatments, etc.) indicated by the data from the town that had never been fluoridated (Annan). Still, what about those studies which showed no increase in tooth decay when fluoridation was stopped? Studies in Cuba, the former East Germany and Finland are frequently quoted by anti-fluoridation activists. I discussed these in my article What happens when fluoridation is stopped? In all the studies referred to the researchers themselves drew attention to the role of other factors which helped maintain oral health. For example, the introduction of a school mouthrinsing programme, which has involved fortnightly mouthrinses with 0.2% NaF solutions” in La Salud, Cuba. Or “improvements in attitudes towards oral health behaviour and, on the other hand, to the broader availability and application of preventive measures (F-salt, F-toothpastes, fissure sealants etc. )” in the former East Germany. The whole issue of dental health is clearly complex and many factors influence it. As a scientist used to dealing with complex issues you must surely agree the scientific literature should not be cherry-picked. It must be approached critically and intelligently. Apply It, or Swallow It? In recent years the differentiation between swallowing fluoride and coating teeth with it has become lost in the discussion. But this differentiation is essential. The overwhelming consensus among scientists, including the Centers for Disease Control CDC and the National Research Council, is that fluoride works when it’s applied to the tooth surface, NOT when it’s swallowed. I know this is the position anti-fluoride propagandists keep promoting but it doesnt actually accord with the evidence. Research shows ingested fluoride plays a beneficial role during tooth development before eruption (see my article Ingested fluoride is beneficial to dental health. With existing teeth fluoride transferred from water and food during drinking and eating helps maintain a concentration in saliva and tooth biofilms necessary to inhibit tooth decay by a surface reaction. Researchers usually refer to the reaction of fluoride at the tooth surface responsible for inhibiting demineralisation and promoting remineralisation as the “predominate” – not the only – mechanism for the beneficial role of fluoride. Unfortunately, opponents of CWF claim this surface mechanism means that ingested fluoride plays no role and fluoride is only effective when topically applied – as with toothpaste. This is a gross simplification and distortion. Ingested fluoride is beneficial to teeth duing their development before eruption. And ingested fluoride contributes to the surface reaction protecting existing teeth. Fluoridated toothpaste (and dental fluoride applications) also contribute to this surface reaction. But the more frequent “top-up” of saliva fluoride concentrations via drinking fluoridated water also make an important contribution. Jane, I don’t claim to have provided the final answer to all criticisms of community water fluoridation here. I have simply responded to your assessments and shown why I think them wrong. I am open to hearing your responses to my critique and welcome any scientific exchange on this important issue with you. Why would an educated individual who reports to have a Masters in Geochemistry and a PhD, claim that she has researched a science/healthcare issue such as water fluoridation then do nothing but regurgitate the same, stale, “arguments” which can be found on every little antifluridationist website? Obviously she has done no valid research on fluoridation, from legitimate sources. Typical antifluoridationist.